Are you betting on the Relay or the Relationship? UPS made headlines July 31 with its decision to purchase Coyote Logistics for $1.8billion with an impact of $100 to $150 million in estimated savings toward its annual operating costs. On first glance, I viewed the decision as merely an attack strategy. The big bad wolf UPS protecting its turf against aggressive competitors. Maybe. This story wasn’t the only merger news this summer. Thomson Reuters reported in July that M&A activity or US Equity Capital Markets increased 7% from last year. In this light, it makes sense to look harder for the underlying value multipliers Coyote offers UPS, especially since organic growth proves increasingly elusive. Several studies about third Party Logistics providers (3PL) suggest for example, that the provision of capable IT services increasingly matter to shippers in their choice of provider. Whether the [Freight] Forwarding [business], is too complex and too dependent on longstanding relationships for new online entrants to compete. For some time I’d been stewing about relationships so her initial question caught my attention. I too wondered what might business complexity or longstanding Relationships imply about competition and the growth prospects for any given company. The significant level of capital entering the sector also prompted me to learn more. Here’s what I learned. Strategy, I’ve been taught, depends on a company fully understanding its strengths and then intentionally adjusting its capabilities and capacity in order to insure its growth. These same capabilities and capacities enable the organization to compete effectively whether it’s entering new markets and/or developing new services/products to sell to its existing and or expanding customer base. In my experience as a consultant, upgrading infrastructure or investing in process improvements generally rank low among C-suite priorities. I don’t know much of anything about the logistics and transportation sector so I had a lot to learn. The Freight and logistics Carriers industry breaks down according to different capabilities and competencies. Air, vs. water vs. Ground transportation operational differences, travel times naturally differentiate their cargo and pricing. 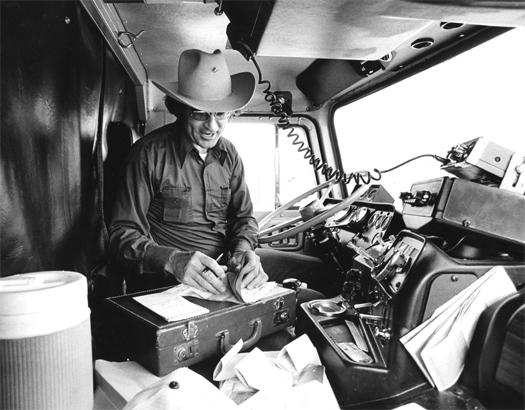 The US Census industry classifications differentiate freight by carrier type and 2014 revenue for Trucking Transportation totaled $261B, of which $172B or 66% was in general freight trucking. But Third party logistics (3PL) revenues for the same period were $176.2 B. Now Ms Phillips’ statement began to make sense. Coyote Logistics founded by Jeff Silver with his wife Marianne in 2006 entered the Transportation and Distribution industry focusing on the Full truck-load segment. Aided by capital from Warburg Pincus, Coyote solidified relationships with independent carriers and pressed development of proprietary TMS-Transportation Management Systems to become a formidable player in this end of the Logistics/Transportation industry. Coyote wasn’t the biggest but growth in the last 10 years landed it in position #39 among the top 50 3PL. In contrast, UPS takes the #1 spot on Global 3PL. Its history shows it chose a more vertical integration approach owning its own fleet in order to specialize local delivery or the last mile. It’s effective use of technology and innovations with sensors furthered its industry leadership position and revenues. That is until 2013, when leadership underestimated the volume of internet purchases and found themselves scrambling to find partners to help meet its delivery promises. Enter Coyote, whose intelligent systems and on demand capabilities helped support UPS and sustain its commanding presence in partial truckloads, a completely different end of the Freight carrier market. I could make a bad pun about parcels to prove this point but UPS Chief Executive David Abney speaking to the Wall Street Journal summed up the rationale for the acquisition this way. More concretely, Armstrong Associates Research reported that Revenue for US third-party logistic companies rose 7.4% to $157.2billion , faster than the 2.8% growth in logistics spending overall. UPS reportedly plans to allow Coyote to operate as an independent entity, which may be wise given the clash between the two cultures. Whatever cost savings they’ve estimated, avoiding fully integrating the two businesses seems to insure they’ll be able to book them. Each company and their proven innovation success begs the question of what’s the combined entity strategy? Price Waterhouse Coopers 17th Annual CEO survey inquiry into innovation, I hoped might offer some further insight into what might be next, but also I was hoping to uncover some data that might enlighten me further about relationships with respect to growth strategies. I don’t know whether UPS or Coyote participated in the PwC survey. I do know however that PwC cares about building relationships and I was able to use the interaction tool on their website to explore the survey results. Here are a couple of snap shots I found interesting and relevant. Read another way, 57% of all surveyed CEOs use external partners to develop more than 11% of their total new products and or services. 12% go it alone. These results vary by industry. In Banking 23% of CEOs do not engage with external partners to develop new products or services. By contrast, 70% of Pharmaceutical companies partner in their development of more than 10% of its innovative goods and services. In Logistics/ transportation , 7% of firms got it alone and another 37% use partners less than 10% of the time. These external partners support what Erica Phillips suggests, that relationships may prove more advantageous to the balance sheet than previously recognized. Then again, it’s tough to generate organic growth. Disruptions hit every industry and increasingly come from everywhere. Finding appropriate, maybe complementary external partners offers more businesses a fighting chance. But does the sector dependence on relationships deliver different returns? What about the innovation methods or modes, might they matter too? PwC’s data contained little additional insight as shown in the pie chart to the right. 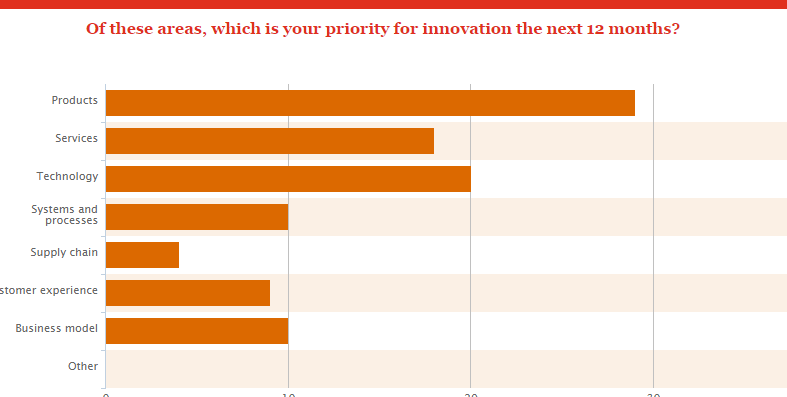 Open Innovation (gray) proves to be overwhelming preference over other options. Again, I took a closer look into the different industry data to see what if any variation might reveal. Insurance CEOS prefer open innovation 41% of the time, significantly more than other sectors, with Pharmaceuticals, following closely behind at 36%. MedTech hedges its bets preferring investing in both Design Thinking (32%) and Open Innovation methods (32%). 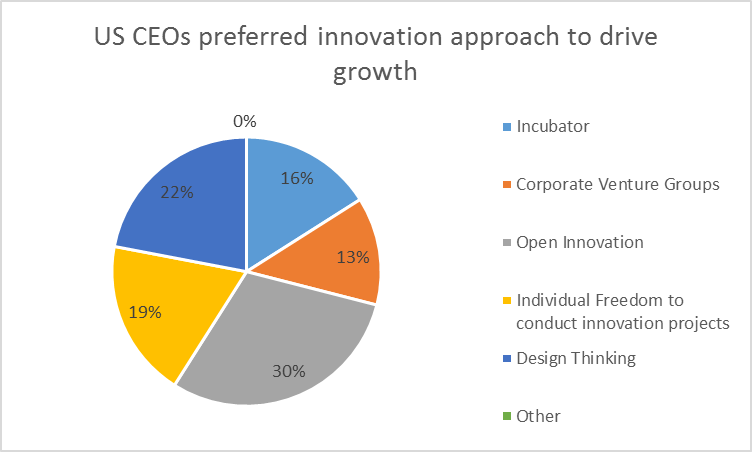 Healthcare too divides its approach but chooses Open Innovation (40%) and Open Experimentation (28%) with little investment in Incubators or Design Thinking. I didn’t find any additional data explaining a firm’s choice of innovation to understand why the variation between sectors exists. Perhaps it’s merely experience and timing from start to finish that determines the methods chosen. Time pressures and management’s ability to maintain free cash flow and/or dependence on external partners’ capital also affect a business growth strategies. Would Coyote be as successful without the support of Warburg Pincus and its private vs. public status? Thomson & Reuters reported that US M&A Deals totaled $1,260.4B as of July 30, 2015, a year over year increase of 66%. 77% of those deals were strategic M&A and the balance private equity M&A. Transportation Logistics is not a category Thomson Reuters breaks out, but when Silicon Valley becomes interested as Ms. Philips reported private equity and venture capital are definitely seeing opportunity in this sector. Though, I suspect they don’t necessarily represent the only types of strategic partners, I don’t have the data to know. 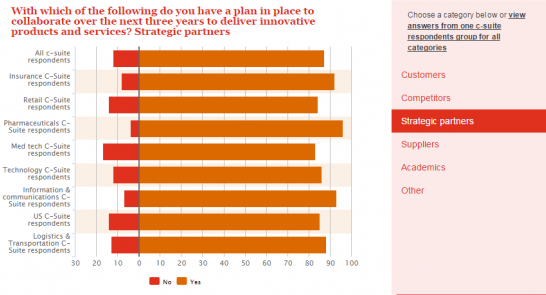 PwC’s survey data below does show that CEOs plan to collaborate in order to deliver innovation, and rely heavily upon strategic partners to help them. In fact 96% of Pharmaceutical CEOs expect to collaborate with strategic partners as will 92% of Insurance CEOs, with about 84% of other sectors pursuing similar plans. In other categories of collaboration PwC found that 83% of Med Tech CEOs expect to lean more on their suppliers while 51% of Pharma companies expect to work more closely with their competitors– which may also account for the recent consolidations occurring in this sector too. Data from Thomson and Reuters as of July 2015 reported significant increases in all sectors level of M&A Deal value this year over 2014. The top values occurring in Energy and Power(15.4%) and Healthcare (15%), where as Retail had the greatest increase overall in activity– 82% more deals than in 2014. Neither of these data sources satisfied my desire to understand the nature of these B2B collaborations with external partners and its relative impact. If strategic partners exclusively imply access to capital, then the value of these relationships’ impact narrows considerably. It suggests a strong connection between purpose and category of collaborator and the choices that subsequently get made. What does this imply with regards to the earlier reference to Erica Phillips question. What strategic advantages and their roots in complexity, if any might longstanding relationships preserve? Few people mistake digital transmissions of information for relationships and subsequently most of what gets’ measured about relationships isn’t materially what matters. In other words, technologies permit better relay of vast quantities of data. Does the relay alter our understanding of value associated with different elements or even impact activity occurring along the logistics/transportation network? Historically, the capability to collect, transmit and evaluate the variety of contextual information and understand their effects on profitability were limited. Thus companies who effectively marshaled human capabilities could command a premium for their foresight, planning etc. Leadership valued those who could easily relate the significance of different data from the field and/or share it in a timely manner as it allowed them to maintain command across the system. I don’t know if span of control is low in the logistics business but I imagine this to be true. Today sensors and boosted transmission capabilities make it possible to collect and quantify relayed information and construct context that readily exceeds human’s capability to relate its significance. Both UPS and Coyote invested in developing these capabilities while also maintaining and nurturing interpersonal relationships with their field operators in order to maintain and grow their competitive advantage in both respects. The merger grants the two organizations opportunities to deepen their collaboration, learn from each other as well as from their longstanding relationships making them a formidable competitor indeed. If you thought that the relay of goods as well as data drives success in the freight and logistics business maybe now you will appreciate the value they accrue through their relationships too.